Posted on Wed, Mar 28, 2012 : 11:35 p.m. It has been almost 15 years since the media projected the Michigan football team to finish fifth in the Big Ten in 1997. And Lloyd Carr still hasn't let it go. The former Wolverines coach co-hosted a benefit dinner Wednesday night sponsored by the student group Appreciate and Reciprocate. Also on the panel were Mike Martin, a captain from last year's team, and Dhani Jones, a linebacker who played for Carr on that 1997 squad. Michigan went 12-0 that season and captured the school's only national championship since 1948, despite those modest expectations. "The only thing I can tell you about 1997 is this: In the preseason, the media in Chicago ... everybody there is looking for a story," Carr said. "And the story in 1997 was Michigan, the M stood for mediocrity." 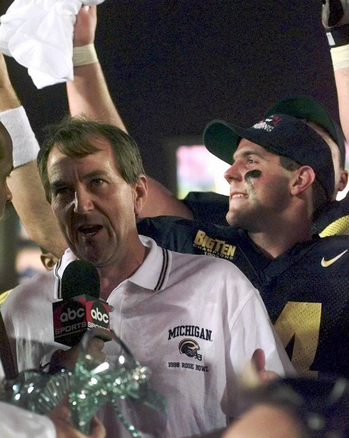 Coach Lloyd Carr and quarterback Brian Griese are interviewed after a 1998 Rose Bowl victory over Washington State that earned the Wolverines a share of the 1997 national championship. The team was picked to finish fifth in the Big Ten. Carr recalled his team's first meeting that season, which lasted for hours as the Wolverines grappled with how to exceed those expectations. Finally, Charles Woodson, a player who just months later would cement his legacy as one of the program's finest players, settled things. "It had gone on for several hours, and everybody was getting frustrated because we needed to put (our goals) down," Carr said. "Finally, Charles Woodson just said, 'Look, let’s just win. Every day. Let’s just come in here every meeting, every practice, every game, and win. And that’s what they did. "They went out and won 12 straight games, and it was against a very, very difficult schedule and did something no one predicted they would do." Woodson, a cornerback who also played receiver, won the Heisman Trophy that year. He is the last Michigan player to win the award. "The message for you is this," Carr told the crowd in a large luxury suite at Michigan Stadium. "You’re all going to have people in your lives that will tell you you can’t do something. Don’t listen to them. Don’t listen to them." That, more or less, was the theme of the evening. Appreciate and Reciprocate helps underprivileged and crisis-stricken students stay in school. Club president Sara Ginzberg estimated 250 people attended the event, although didn't know how much money was raised. In attendance included former Michigan basketball players David Merritt and C.J. Lee and football player Tony Anderson. Jones, Carr and Martin each are heavily involved in charity work and the local community, which made them logical choices as speakers. Carr's work is most notable, including raising millions of dollars for C.S. Mott Children’s Hospital. The seventh floor is named after him. He said among the many reasons he is involved with the hospital is a 10- to 12-year-old girl he met there. The girl, who had cancer, was faced with choosing between keeping a leg that didn't function properly or amputating it so she could get a prosthetic limb that would allow her to play soccer. She chose to amputate the leg. "To see the courage, and to see this young girl, and to hear the enthusiasm in her voice," Carr said, "and she’s going to do something 10 or 15 years ago she could never do, and she can do it, (it's amazing). "That’s the kind of thing that happens up there every day." Martin has started Category of One, a campaign that encourages expressions of individuality. He also is active in the local business and philanthropic communities. 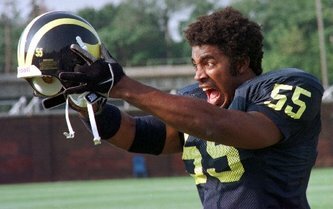 The gregarious Dhani Jones has some fun at the Michigan football team's 1998 media day. Jones, who was a sophomore linebacker on the 1997 national championship team, founded Bow Ties For A Cause in honor of a friend who had lymphoma. He's come a long way from his freshman year, when he nearly was kicked off the team his first day. "The seniors are in charge of this meeting every fall, and they’re empowered, the captains, where the team sets the goals for the season," Carr said. "I had been there 17 years, and had never, ever heard a freshman speak in that meeting. "The meeting starts, and to my consternation, Dhani is dominating the meeting." Jones said he was called into Carr's office, and told to do things the "Michigan way," or he was gone. He chose the former, and went on to win a national title and play 10 years in the NFL. Carr is easygoing these days, now that he's well into his retirement, but he remains as sharp as ever. One person knows that well, after his cellphone went off while Carr was speaking. "When I became the head coach, we had a strict rule," Carr said. "I always said there's only two types of people who have cellphones: Doctors, and drug dealers, and I know there aren't no doctors in here. "That's changed a little bit, so you probably don't get that one." Click here to find out more about Appreciate and Reciprocate, or follow the club on Twitter @AReciprocate. Thu, Mar 29, 2012 : 6:58 p.m.
As in life in general, any man or woman that has been there before and been successful is a valuable asset, such as Lloyd Carr. Now you take a person that just comes on our Mich. sites and babbles just to hear themselves talk nonsense, that is useless. Thu, Mar 29, 2012 : 4:14 p.m. Which coach was it that tanked Michigan in the coaches poll because of bitterness again? The Tennessee coach? Thu, Mar 29, 2012 : 3:38 p.m. It was a nice event, but the most impressive thing about it was the student organization which sponsored the event. These are University of Michigan students who have come together to give back, increase community, and raise money for other University of Michigan students. It shows a lot of initiative and selflessness. I appreciate that these speakers were willing to lend their voices to the cause, and I loved hearing from them, but if you ask me the real stars of the night were the students in Appreciate &amp; Reciprocate. Keep up the good work. Brady Hole's goal is to mold a Michigan football like that of 1997-98. Great offense with great defense. Times have changed as the game is much different in many aspects but the fundementals are there. Hoke is also stoking the emotional aspect: having the will and determination to win. Hoke as on the staff in that 1997-98 team and it is apparent to me what his motive is in present time. He's off to a very good start. Thu, Mar 29, 2012 : 12:56 p.m. Most valuable lesson from the 1997 season: even if you only win 1/2 a championship, everyone will still call it a championship. Thu, Mar 29, 2012 : 7:01 p.m.
SMC, if your going to add a negative, please at least be entertaining. Thu, Mar 29, 2012 : 2:56 p.m. Considering four of MSU's &quot;six&quot; titles were either split, or MSU just claimed them whenever any random service gave them a #1 rating, I'll take our 11. The last in 1966. Thu, Mar 29, 2012 : 1:51 p.m.
Oh wow. That's a new one. Same old lame argument. Get some new material.